There are hundreds of dental products on the market with new ones being launched every week. These are some of the products we like recommending right now. 1. 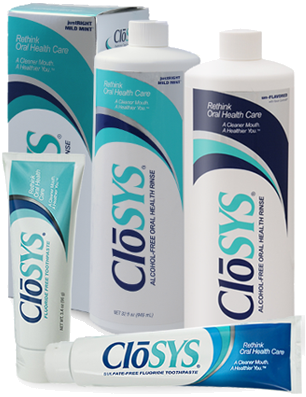 CloSYS- CloSYS makes mouthrinse, toothpaste, and oral spray, but we tend to recommend the mouthrinse mainly. It is an mild alcohol-free rinse perfect for patients with dry mouth, but due to it's stable chlorine dioxide, it is perfect for bad breathe in these patients. New studies are showing that it is almost as effective(a) than Chlorahexadine but with little side effects. The original has very little flavor so patient acceptance is high with CloSYS. 2. Interdental Aids- Hygienists love to talk about floss. It's all about the floss! However, there are so many great interdental aids on the market and honestly, lots of patients would benefit from these more than traditional floss. Right now, we love recommending Gumchucks to our patients have have a hard time wrapping floss around a tooth like teens and ortho patients. They even have an autoclavable handled set for dental professionals to use in the office. 3. Xylitol- Xylitol can be recommended for many types of patients- dry mouth, teens, kids, orthodontic patients, even new moms. A recent study (b) showed that if a new mom chewed 3 pieces of xylitol gum a day, the bacteria transfer between her and her baby was lowered and less decay was present at age 5. Since most people chew gum, this is an easy way to have mothers help their babies with minimal effort. Though these are the products we love right now, they many change in a few months as new products are developed. Keep an eye on the market, walk down the dental aisle at the grocery store every so often, and have reps come to your office and give lunch and learns to stay up on the latest and greatest to help your patients. What do YOU like to recommend to your patients? (b) Nakai, Y., et al., Xylitol gum and maternal transmission of mutans streptococci. J Dent Res, 2010. 89(1): p. 56-60. - Moms chewed xylitol gum 3x day and it decreased caries in children.